Cape Town - The Titans and Dolphins were left frustrated by the weather after rain washed out their latest CSA T20 Challenge outing in Benoni on Friday. 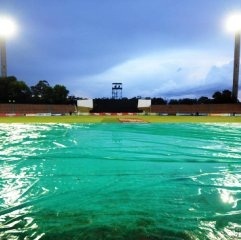 Not a single ball was bowled at Willowmoore Park after persistent rain made it difficult for any action to take place. It meant the game was called off just over an hour after it was due to begin at 6pm. The two points each took the hosts to seven points from three matches, one more than the visitors on six.